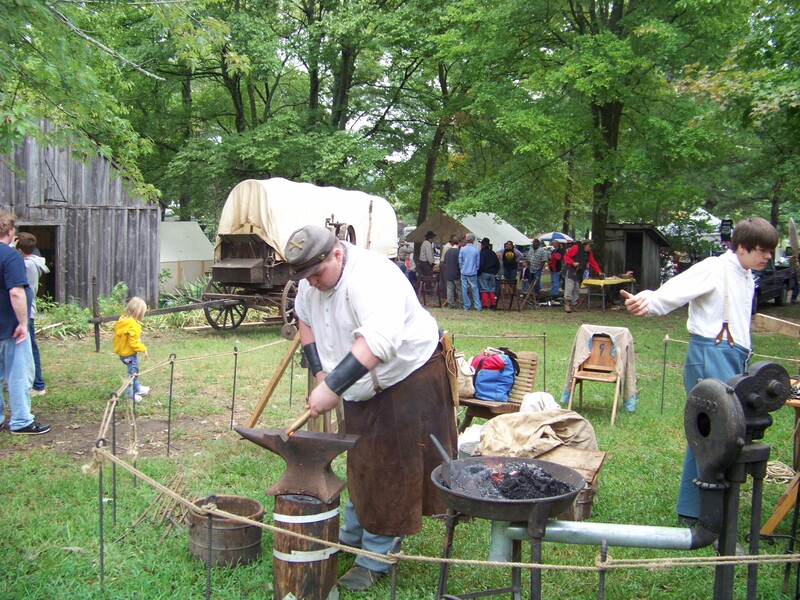 Visitors enjoy a demonstration of blacksmithing skills during Randolph County Pioneer Days. Randolph County, Arkansas, (population 18,195) was one of the first areas in the state to be settled by U.S. citizens before and after the 1803 Louisiana Purchase. The county was created in 1836, the same year Arkansas attained statehood. Randolph County contains the oldest standing log structure and dwelling in Arkansas. Both are now being fully restored. It also contains sites of several significant Arkansas firsts: the first courthouse, the first U.S. Post Office, and the first school. The county served, at various times, as the site for the headquarters of the Trans-Mississippi Department of the Confederacy, the Confederate Army of Missouri, and the Army of Northern Arkansas. Today, lowland farmers export rice, soybeans, corn, and other grains, while there are cattle ranches and poultry houses in the uplands. The wooded area, five rivers and numerous smaller streams attract fishermen and hunters to the region. Over the years, the county government has given ongoing support to several preservation projects, including Maynard Pioneer Park and its Maynard Pioneer Days held annually in September. The community created this 15-acre park in 1980 to preserve and celebrate the county’s pioneer heritage. At the same time, the town initiated the annual celebration to celebrate its history through crafts, artifacts, and programs. Other preservation efforts by the county include providing funding and labor to Five Rivers Historic Preservation, Inc. to establish the Randolph County Heritage Museum in 2006. The county also helps preserve its venerable cemeteries, including road building and brush and tree removal to rescue the 1827 Friendship Cemetery, the county’s oldest and largest African American cemetery, with many graves predating the Civil War. The Eddie Mae Herron Center and Museum celebrates and preserves the history and heritage of the county’s African American population and hosts annual events. The Ravenden Springs Museum contains artifacts and exhibits on the community’s history including its heyday from 1880-1940 as one of Arkansas’s main spas. Randolph County has active citizen involvement in the preservation and exhibition of its heritage and history. In addition to helping at local events and museums, volunteers lifted and moved the old Crosby Shell Button Factory from its riverbank location to the Randolph County Heritage Museum. The factory was disassembled and then reassembled inside the museum, and is complete with the button punching machines used to make shell buttons in the late 1800s and early 1900s. These machines are in working order and local volunteers demonstrate how to make shell buttons at the museum on a regular basis.